The Wisconsin Badgers have opened the season 2-0 after a 31-14 win over Florida Atlantic on Saturday afternoon. Like the opening game versus Utah State, there were bright spots and some concerns. We provide our notes and takes on both this game and the 2017 season. 1. Jonathan Taylor makes his case to be starter going forward – Taylor got the start against FAU after an injury sidelined Bradrick Shaw and Taylor showed the coaches the decision was an excellent one. Taylor showed both his power and speed on his two first half touchdown runs. Taylor finished the game rushing for 223 yards and 3 touchdowns on 26 carries. His backup, Chris James, also showed some good rushes after a tepid first game. James finished with 101 yards on 16 carries and the Badgers averaged 6.6 yards per carry. There are plenty of positive things to say about Taylor and his touchdown runs have been great to watch over and over again. Taylor is just a freshman, which is great for the Badgers if he continues at this pace. However, solid production from a healthy Shaw and James will be key to keep Taylor fresh at the end of the season. The first two games were against Utah State and Florida Atlantic, teams the Badgers should dominate and look good against. The competition the rest of the season will be much stronger. Injuries and poor quarterback play could make it an uphill battle for the entire rushing attack. Taylor lost a fumble as well in the third quarter, which, at this point, appears to be more of the exception. Based on what we have seen in two games, Taylor should be the starter at running back with Shaw and James getting plenty of touches as well. It is a long season and three different options behind the offensive line will help the entire offense. 2. Alex Hornibrook struggled to see the field – It was clear that Alex Hornibrook was not having a good day. The timing was not there as he constantly threw behind his receivers and then there was the horrendous interception. On that particular play, he was going backwards with a defender in his face and he forced a throw without even seeing the defender that made the interception. It was a throw that should not have happened and it led to a touchdown for FAU. Late the second quarter, Hornibrook threw another pass on an out route to the sideline that was woefully short and nearly picked. Luckily for him, it was dropped, but another example of his timing and arm strength being not good enough. Overall, Hornibrook has to get better if he wants to stay the starter. The timing, precision, arm strength, and general awareness all are a concern though he is just a sophomore. There is time for improvement, but how long does he have before Jack Coan is called on for a bigger role? 3. The secondary gets torched – Florida Atlantic had 142 yards passing, yet it felt like it was far more. FAU’s DeAndre McNeal had catches of 35 and 63 yards with the latter going for a touchdown. There was also another 35 yard pass play to McNeal in the third quarter following Taylor’s fumble, but that was negated due to a holding. Given the memories of 2016 when Penn State moved up and down the field on the Badgers at will in the Big 10 Championship, it is worth watching this unit to see how they respond going forward. 4. Injury concerns are mounting – The defense was already short due to the losses of Jack Cichy and Zack Baun for the season. During practice on Wednesday, Chikwe Obasih suffered a knee injury that will keep him out for a few weeks. Now, the offense has some injury worries with Shaw ruled out and then right guard Beau Benzschawel left the game in second quarter and did not return. There is currently no news on the severity of the injury, but the loss of a starter on the line does not bode well. Was told #Badgers Benzschawel lobbied to stay in. Staff told him to call it a day. 5. The overall performance felt mediocre – The Badgers dominated this game on offense with 564 yards compared to 248 yards for FAU. They had just one penalty and held the ball for over 38 minutes. However, it was an inefficient game. The Badgers turned the ball over twice, were stopped three times inside the two yard line early in the second quarter, several passes were dropped, and even Rafael Gaglianone missed a 37 yard field goal. The first half against Utah State and most of this game was nothing like the Badgers we expected to see in 2017. The entire team will have to improve quickly because the non-conference schedule ends next week with a road trip to BYU. Next week’s game at BYU will be at 3:30 PM Eastern Time and can be seen on ESPN. The Badgers will have a bye the following week before starting Big 10 play against Northwestern at home on September 30. The Wisconsin Badgers have finished the 2016-17 season with a 24-16 win over the Western Michigan Broncos to end at 11-3 overall. It was another double digit win season for the Badgers as 2016 marked the sixth time in the last 8 years they have won at least 10 games. We will give a grade to each unit on the team as well as an overall team grade and a grade for head coach Paul Chryst. For a measuring stick, here is the midseason report card and we will include the midseason grade for each unit below. Let’s start with a quick glance at the results of each game for the Badgers. 2016 was not an easy year for Paul Chryst in his second season. He had to juggle two quarterbacks, a new defensive coordinator, and what looked like a daunting schedule. Looking at the entire season, he did well switching between Bart Houston (began the season as the starter) and Alex Hornibrook. The hire of Justin Wilcox as the defensive coordinator already looks like a steal. The Badgers allowed 13.7 points per game in 2015 and saw that increase only marginally to 15.6. The yardage allowed per game do go up from from 268.5 in 2015 to 301.4 yards per game. Still, the defense played well this year, but Wilcox has departed for the California Golden Bears’ head coaching vacancy. The Badgers will have their third defensive coordinator in three years for the 2017 season. The schedule before the season looked imposing. They had LSU, Michigan State (away), Michigan (away), Ohio State, Nebraska, and the potential for a Big 10 Championship Game. The Badgers ended up facing 7 teams that were ranked in the top 15 at the time of the game for the 2016-17 and went 4-3 in those games. Granted, some of those teams were far from being top 25 material by season’s end, but the Badgers navigated the season well under Chryst. Bart Houston began the season as starter, but was replaced in the Georgia State contest by Hornibrook. After that game, the duo split time behind center though Hornibrook was injured versus Minnesota and subsequently missed the Big 10 Championship game. Many pundits lament the two quarterback system, but these two actually worked pretty well though they were far from game changers. 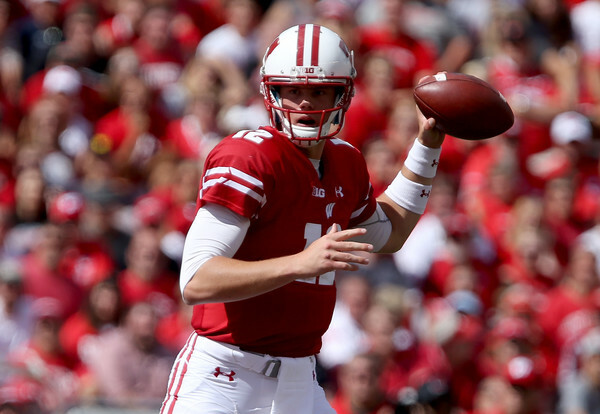 We noted that on the midseason report card that Hornibrook had looked like the better of the two quarterbacks after five games. By the end of the season it was far more even as Houston gained confidence and was more efficient. Houston finished the year with 1,245 yards (68.1%) with 5 touchdowns and 3 interceptions. After being benched versus Georgia State and not playing the next three games, Houston threw 70 passes and completing 52 of those (74%) for 718 yards with 3 touchdowns and 1 pick. Hornibrook finished the season with 1,262 yards (58.6%) with 9 touchdowns and 7 interceptions. In the Badgers’ final eight games, he went 52 of 85 (61%) with 4 touchdowns against 1 interception (remember he missed the Big 10 Championship). He has some things to work on like his reads, throwing the ball into coverage, etc., but he has a bright future as long as he continues to improve. It is not hard to see how the running game changed over the Badgers’ season. Over the first five games Wisconsin averaged 161.6 yards per game on the ground. In the final 9 games the Badgers averaged 226.1 yards rushing per game. Corey Clement easily led the team in rushing with 1,375 yards (4.4 yards per carry) with 15 touchdowns. In addition, the final 9 games saw Clement have at least 100 yard performances 7 times. Dare Ogunbowale had a few big games against Nebraska (120 yards and a touchdown) and Illinois (103 yards) to finish with 506 yards (5.6 YPC) and five touchdowns. He also played a big role in the passing game with 24 catches for 208 yards and a touchdown, but it felt like he was a go to receiver on third down for much of the year. Both Clement and Ogunbowale are seniors, which means that freshman Bradrick Shaw could feature prominently in the future. He had 457 yards and 5 touchdowns on 88 carries (5.2 YPC). He did have some fumble issues, but his strength, power, and quickness could make for a scary sight in the next few seasons. He could be in a backfield with Taiwan Deal (164 yards rushing) and Pittsburgh transfer Chris James (690 yards rushing in two seasons) in 2017. Wide receiver Jazz Peavy had a big impact in the rushing game as well. He was used almost exclusively on the end around to finish the season with 318 yards rushing and a touchdown on just 21 carries (15.1 YPC). He came up big throughout the season when called upon and he could see a familiar role in 2017. As with any run-heavy Badger offense, the wide receivers are not likely to put up big numbers. There were some stars that emerged in Jazz Peavy and Troy Fumagalli. Peavy finished as the leading receiver with 43 catches for 635 yards and 5 touchdowns (along with the aforementioned rushing impact). Fumagalli had 47 catches for 580 yards and 2 touchdowns, but bookended his season with very good performances against LSU (7 catches for 100 yards) and Western Michigan (6 catches for 83 yards and a touchdown). Both players are juniors and if either of them leave for the NFL, that would create a big void in the passing attack. Ogunbowale was instrumental in the passing game, but he will move on as a senior. Robert Wheelwright caught 34 passes for 448 yards and 1 touchdown, but is a senior. George Rushing had just 12 catches for 136 yards and was spotty throughout the season. With more consistency he could be a possible #2 opposite of Peavy, but he has a ways to go to fill that void. Three freshmen who saw some playing time in 2016 and worth keeping an eye on in their development were Kyle Penniston (6 catches for 102 yards and 2 touchdowns), Quintez Cephus (135 total offensive yards), and A.J. Taylor (72 total offensive yards). The offensive line had a slow start this season. Injuries and new quarterbacks hurt them. It took until after the Michigan game for the line to assert itself. The first five games saw the Badgers average just 3.8 yards per carry while that number shot up to 4.6 yards per carry over the final nine games. For the season, the Badgers averaged 4.3 yards per carry, which was better than 2015’s number of 3.8, but still less than the lowest output between 2009 and 2014 of 4.6. Tackle Ryan Ramczyk was named as a first team All-American. Ramczyk will move on to the NFL creating a massive void to refill. The offensive line had allowed 8 sacks in the first five games, but gave up another 16 the final 9 games to make it 24 on the season. To be fair, the sacks are not always the fault of the line and both Houston and Hornibrook had a tendency to hold on to the ball too long from time to time. In 2015, the Badgers allowed 23 sacks. The offensive line did make good progress over the course of the season particularly in the running game. There was a clear change in the offense between the Michigan and Ohio State games. It is worth mentioning that between those games was the Wisconsin bye week, which probably allowed them to re-focus the offense. The running game came alive after the bye week while Houston looked more efficient. The Badgers averaged 28.4 points, 382.1 yards, 203.1 rushing yards, and 179.1 passing yards per game. The total yardage was similar to 2015 (378.6 per game), but the emphasis was more on the run (150.3 yards rushing per game), which was not surprising given a new quarterback. The offense will need to work on being far more efficient in the red zone. They had 58 red zone trips and converted 49 of those into points (84.4%), which ranked 63rd in the country. However, only 37 of those trips resulted in a touchdown (63.8%). This is a big area of improvement for the Badgers in 2017. The linebackers had a great year in 2016 led by the T.J. duo. T.J. Watt led the team in sacks (11.5) and tackles-for-loss (15.5). His partner T.J. Edwards led the team in total tackles with 89 while also recording 3 sacks and 8.5 tackles-for-loss. Jack Cichy was on his way to a stellar year after 7 games before a torn pectoral ruled him out the rest of the season. Cichy recorded 60 tackles, 1.5 sacks, and 7.5 tackles-for-loss. Ryan Connelly (59 tackles and 7 TFL), Garret Dooley (40 tackles, 3.5 sacks, and 6.5 TFL), and Vince Biegel (44 tackles, 4 sacks, and 6 TFL) were big contributors to an incredible linebacker group. Only Biegel is a senior though Watt (a second team All-American) or Edwards could bolt for the NFL after stellar campaigns. Chris Orr will also return after missing 2016 with a torn ACL. Defensive ends Connor Sheehy and Alec James, both juniors, had similar seasons on the stat line. Sheehy had 27 tackles, 2.5 sacks, and 4 tackles-for-loss while James finished with 23 tackles, 3.5 sacks, and 3.5 tackles-for-loss. Also returning on the defensive line are Chikwe Obasih (31 career starts along with 22 tackles in 2016), and Olive Sagapolu (14 tackles and 1 sack). The possibility of everyone outside of Biegel returning is tantalizing, but the NFL is a loud call this time of year. Still, the front seven should be a deep and talented group for the Badgers next season. One clear area of regression as the season went on was in the secondary. Perhaps the Georgia State game was a sign of things to come for the final few games, particularly the Big 10 Championship. The Panthers were able to put up 269 yards through the air that day and a few other teams had some success as well. Northwestern threw for 277 (they played from behind the whole game), Purdue had going deep, and then Penn State gashed the back four with ease in the second half. Sojourn Shelton had 4 picks and 12 pass breakups (most on the team) while Leo Musso recorded 74 tackles and 5 interceptions (led the team). Derrick Tindal had 3 picks and 11 pass breakups and Lubern Figaro finished with 7 pass breakups. Tindall and Figaro will both be seniors in 2017 as will D’Cota Dixon (60 tackles and 4 interceptions) and Natrell Jamerson (mainly a return guy, but he did have 19 tackles and 4 pass breakups). Those four, along with others, will need to step up to replace Shelton and Musso. This group faltered down the stretch and in the pivotal second half of the Big 10 Championship Game versus Penn State. Look out to see if the secondary plays with a chip on their shoulder in the next year after how they finished the season. The defense did play very well for most of the season. The secondary had documented struggles, but they did play well for stretches of the season. The linebackers led the way for this side of the ball and there were some stars we hope return in 2017 to make this another top defense in the nation. The loss of Rafael Gaglianone in late September really hurt then, but after seeing the season play out, that is even more evident now. Gaglianone went 7 of 8 on his field goals and was a perfect 10 for 10 on extra points. Andrew Endicott replaced him and from the start was uneasy. He finished the season 13 of 19 with a long of 46 yards. He made 35 of 37 extra points, but even a few of those were barely inside the uprights. Gaglianone will be back in 2017, which will be a boost to the kicking game. The punting game left some room for improvement. Anthony Lotti averaged 37.7 yards per punt and put 25 punts inside the opponent’s 20 yard line, but he had a few games where he struggled (see the Michigan game). P.J. Rosowski averaged 36.7 yards per punt and also handled kickoff duties. He had 79 kickoffs with 51 touchbacks and just one kick go out of bounds. Lotti was only a freshman in 2016 so he will have a few seasons left as Badgers to get better. Natrell Jamerson had 12 kick returns for an average of 21.1 yards per return while Dare Ogunbowale had 10 returns for an average of 21.3 yards per return. Jamerson had a long of 39 and Ogunbowale had a long of 41 and neither had a touchdown. 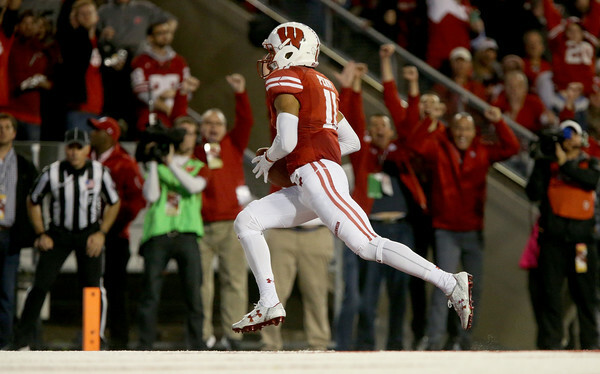 Jazz Peavy returned punts for the Badgers and averaged a paltry 5.8 yards per return on 17 returns. The Badgers can afford to work on the return game going into the 2017 season. 2016 was a very good year for the Wisconsin Badgers. Expectations were subdued with the loss of Joel Stave, Alex Erickson, Michael Caputo, and Tanner McEvoy among others. A new starting quarterback turned into two new starters at that position and both players handled it well. The running game got off to a slow start, but turned it on after the bye week. In turn, the quarterbacks performed more efficiently and the team was able to shake off back-to-back losses to Michigan and Ohio State to claim the Big 10 West. 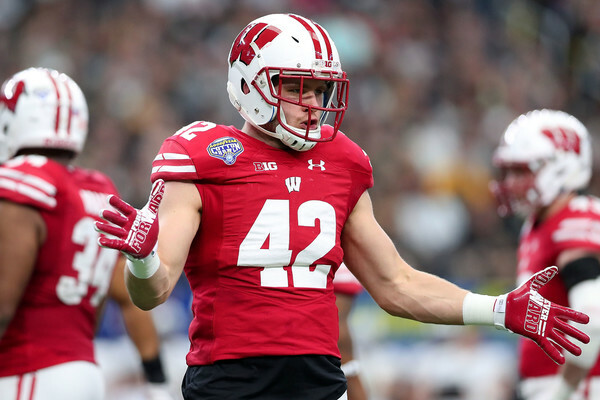 The defense had breakout stars in T.J. Watt and T.J. Edwards under new defensive coordinator Justin Wilcox while Corey Clement remained healthy to have a solid season. Overall, it is hard to argue with the results produced by the Badgers. Many (including this author) thought 10 wins were out of the question, but the Badgers did one better than that and won their first Cotton Bowl. The eighth ranked Badgers have officially hit the halfway point in their regular season after playing the second ranked Ohio State Buckeyes. They played a hard fought game, but came up short 30-23 in overtime. There were some good things and some bad things, which will both be touched on below. 1. The Badgers played a really good game – The loss in overtime is crushing, but the overall play of the team was excellent. They faced a top team and hung with them for the second game in a row. The running game looked like the Badgers of old at times, the defense played well, and the atmosphere was second to none. The game plan was also well thought out. Too much was not asked of Alex Hornibrook (more on him below) and Paul Chryst stuck with the game plan for the entire 60 minutes plus overtime. That may have hurt them in overtime (see the final two plays of the game), but the philosophy did not change. Chryst made it a point to run the ball even when the Buckeyes seized control at 20-16, he kept running the ball. He did so again in the final three minutes and in the overtime. For all the complaining about the lack of Badger-like rushing, this game should alleviate those concerns for the time being. 2. Hornibrook had another Jekyll and Hyde performance – For the most part, Alex Hornibrook looked good. He made the smart play, whether that was throwing the ball away or taking what the defense gave him. He made a nice throw on the touchdown pass to Jazz Peavy to put the Badgers up 10-0 in the first quarter. There were times, however, he looked like the freshman he is. All four sacks in the game occurred on third or fourth down. The first two came on third and manageable during the first half. The third sack was on third and seven early in the third quarter and the final sack was on the last play of the game. Hornibrook has to at least put the ball up on the final play. There were also a few bad throws. His only pick was a floated ball towards Robert Wheelwright that was picked off by Gareon Conley. Conley had another chance for an interception on a poorly thrown ball by Hornibrook but it was ruled incomplete (video below). Hornibrook is a freshman and he will make mistakes. Overall, it was a good performance and the coaching staff will no doubt work on some of those mistakes. 3. The running game looked Badger-esque – The Badgers came to run the ball against Ohio State and that did not change even when they saw momentum turn to the Buckeyes. Corey Clement broke a 68 yard run on the Badgers’ second drive though he was fortunate to not lose the fumble on the play. He finished with 164 yards on 25 carries. The Badgers also employed the end around with Jazz Peavy gaining 70 yards on 6 carries running only that play. The offensive line was physical all night long and that showed. The Badgers finished with 236 yards on 46 carries with negative 34 yards by Hornibrook on the sacks he took. Including that, the Badgers finished at 5.1 yards per carry, which is a nice bump from their opening five game average of 3.8. 4. 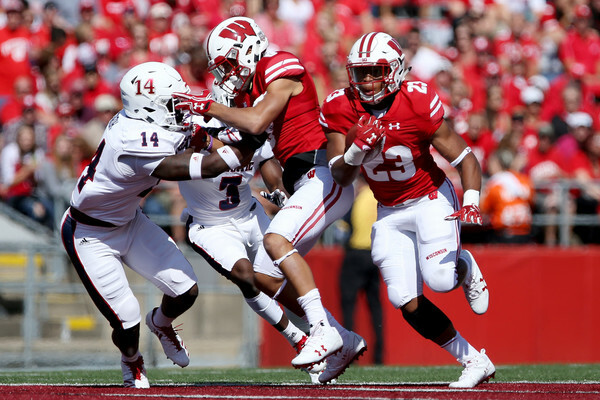 The offense did show some inconsistencies – Hornibrook’s performance was touched on as was the running game, but there are other worries. The offense put up 313 yards in the first half, but struggled mightily in the third quarter with just 11 yards on 10 plays. Yes, Ohio State did make some good adjustments, but only 11 yards in 15 minutes of play cannot happen. Another concern is the red zone touchdown efficiency. The Badgers have shown issues with scoring touchdowns earlier in the season. Coming into the game, the Badgers were 12 for 19 (63%) in scoring red zone touchdowns. Against Ohio State they were 1 for 3 and now sit at 13 for 22 (59%) for 2016. This inefficiency may continue through the end of the season. 5. The defense played solidly against J.T. Barrett – Ohio State presented the Badgers with a new challenge in J.T. Barrett. They did not face a quarterback with his dual threat ability and they performed decently. They did not let him break a big run as he finished with 92 yards and 2 touchdowns on 21 carries. They also played well against the pass with Barrett finishing 17 of 29 for 226 yards. The Badgers did give up a few long passes, but for the most part they did not get torched in the secondary. The one area of concern was the tackling on Barrett. There were quite a few missed open-field tackles, which are understandable, but are also the difference between touchdowns and field goals. 6. Andrew Endicott builds his confidence – Replacing Rafael Gaglianone is no easy task, but Andrew Endicott has done so admirably thus far. He was shaky against Michigan State when he missed his second extra point, but he finished the game with a 41 yard field goal and three of four on PATs. He did not have much to do against Michigan with just one extra point attempted and made. The game against Ohio State was much better. He converted both extra points, but more importantly converted on all three of his field goals. He opened with a 46 yarder on the opening drive before hitting the next two from 32 yards and 22 yards, respectively. He may need to come up big down the stretch and this game is something to keep in mind when he is called upon. The Badgers are now 4-2 overall and 1-2 in Big Ten play after the loss to Ohio State. They will face the Iowa Hawkeyes next week on the road as they look to end their two game losing streak. Below are the previous columns for the Wisconsin games in 2016. The Wisconsin Badgers may be on a bye during week six, but that just means we can review their season up to this point. Consider it a de facto mid-season review through five games. We will give a grade to each unit on the team as well as an overall team grade and a grade for head coach Paul Chryst. Let’s start with a quick glance at what the Badgers have done so far. Paul Chryst is only 18 games into his Wisconsin career and he stands at an 14-4 record. In 2016, the most noticeable attribute for Chryst is the willingness to take a chance and stick with it. He will roll the dice on fourth down as noted by his six attempts on fourth down. Of those, five of them were in opponent’s territory with an average placement of the opponent’s 18 yard line for those five attempts. Then there was switch at quarterback. With the offense struggling against Georgia State in the third game of the season, Chryst pulled Bart Houston in favor of freshman Alex Hornibrook. The move paid immediate dividends as the offense perked up versus Georgia State and he looked solid against Michigan State. Hornibrook struggled against Michigan as did the offense, which is part of larger struggles that will be touched on below. The running game is not up to par by Wisconsin’s standards, which does hurt his grade. Chryst also made the right choice to hire Justin Wilcox as defensive coordinator to replace Dave Aranda, who left for LSU. The defense has not missed much of a beat, if any, despite an injury to star linebacker Vince Biegel. As noted above, Bart Houston started the season at quarterback, but was removed during the second half against Georgia State. Alex Hornibrook came in to spark the offense and then played a solid game against Michigan State. He looked more like a freshman against Michigan, but that was a top tier defense he faced. After watching these two play, it is clear the offense has been better under Hornibrook. Houston’s game against Georgia State was poor, but it was also a perfect mix of things he cannot control coming together: Corey Clement did not play while Taiwan Deal and Troy Fumagalli both were injured during that game. In addition, there is still the chance Houston could come back in if Hornibrook struggles. No matter what happens at quarterback, both have to play better. They will need to be smarter with their passes, not forcing passes, and not getting frustrated. That will come with in-game reps so improvement will be something to look for in the final half of the season. The quarterback position has also been hurt by the poor running game the Badgers have displayed. A good running game can open up the passing lanes. Corey Clement was looking to have a big 2016 season after an injury ravaged 2015 campaign. His first two games were really good against LSU (21 carries for 86 yards and a touchdown) and Akron (21 for 111 yards and 2 touchdowns). It was against Akron that he injured his ankle late in the first half and subsequently missed the Georgia State contest. Against the Michigans, Clement amassed 40 carries for 122 yards and 2 touchdowns (both against Michigan State). It is hard to know exactly how much that ankle injury affected Clement against the Spartans and Wolverines, but his year has been above average. Behind Clement are the duo of Dare Ogunbowale and Taiwan Deal. Ogunbowale has been the better of the two both visually on the field and on the stat sheet with 44 carries for 185 yards and a touchdown (also has a receiving touchdown). Deal has been hampered by injuries and only played in the opening three games (20 carries for 94 yards). The surprise of this year has been freshman Bradrick Shaw despite playing in only two games. Shaw played in garbage time against Akron, but was impressive with 9 carries for 74 yards and a touchdown. He played a bigger role against Georgia State due to the injuries, but fumbled on the goal line in the first half. He finished with 62 yards on 15 carries in that game. He could be a force in the future if the injuries continue and if he avoids injuries of his own. The running game has affected for several reasons: injuries, quarterback play, and opposing defenses. The injuries were documented above, but are not limited to just the running backs as they offensive line has been shuffled around as well. While the quarterback play has not been the best that may have to do with opposing defenses keying on stopping the run and putting the game in hands of Houston and Hornibrook. Despite that, the running back group has been decent. This group was not expected to set the College Football world on fire this year with a new quarterback and some losses of their own to handle. The receivers have shown potential this year and some flashes of being a good group. Jazz Peavy has made some good plays (see an example below) and is the leading receiver with 17 catches for 281 yards and two scores. He also gets in on the rushing game with the sweep to the tune of 54 yards on only 4 carries. Robert Wheelwright has 18 catches for 274 yards while Troy Fumagalli has 16 catches for 181 yards. Both of them have been vital to Houston and Hornibrook as they transitioned at the quarterback position. It has been mainly those three leading the receiving group, but George Rushing (8 catches for 82 yards) has also seen a lot of action. The development of receivers outside of those four will be important as there are not a lot of other proven options. Tight end Kyle Penniston (3 catches for 35 yards and a touchdown) and fullback Alec Ingold (4 catches for 21 yards and a touchdown) have made the most of their very limited action. If the injury bug strikes, that could wreak havoc on this group. The offensive line was expected to be better this year, but that has not been the case. Injuries have caused some shuffling to happen along with breaking in new quarterbacks. The Badgers are known for their run game, but it has not been that great since Chryst took over. Wisconsin averaged 3.8 yards per carry in 2015 and through five games this year have also averaged 3.8 yards per carry. The five games in 2016 have produced the following yards per carry averages: 3.2, 5.3, 3.8, 3.0, and 2.5. The lowest total in the previous 6 years before Chryst (2009 through 2014) was 4.6 so there is still plenty of upside. The pass blocking has been decent this year giving up 8 sacks. That does not tell the whole tale because there have been times when the Houston and Hornibrook have loads of time to find the best pass or open man. Overall, this is a work in progress like the rest of the offense. The offense has been subpar this year even when taking in all the factors. The quarterbacks are inexperienced, but have the potential to be solid. The running backs have been banged up, the receivers have been okay, and the offensive line has not been very Badger-like in the run game. No need to sugarcoat this because the front seven has been great. They give up only 12.2 points per game and just 90.4 yards rushing per game to the opponent. 2015 finished with averages of 13.7 points per game and 95 yards rushing allowed per game. 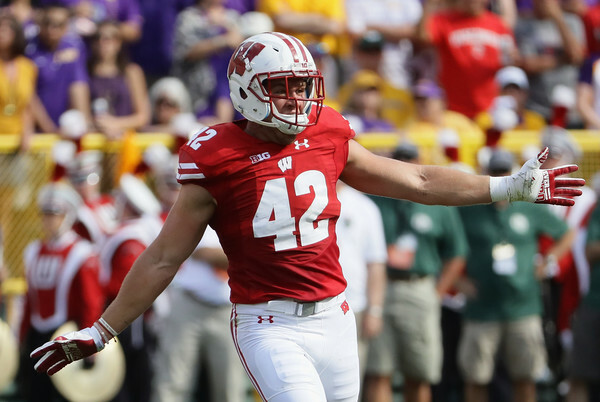 The defense has recorded 15 sacks so far with T.J. Watt leading the team at 5.5 (29 tackles and 7.5 tackles for loss) and Alec James has three. Jack Cichy has been a beast at linebacker (35 tackles and 3.5 tackles-for-loss) along with Vince Biegel, who is currently injured. T.J. Edwards has been huge in the last three games with 26 tackles over those contests. The front seven has easily been the strength for the Badgers in 2016. The only worry is on the injury front especially if it starts happening to more big time players like Biegel. The secondary was considered the weak link of the defense coming into the season and there have been some issues. Their worst outing was against Georgia State when slants and in routes were torching the Badger secondary. The team improved against Michigan State and also against Michigan on those kinds of plays. The secondary is giving up 201 yards per game, which is worse than 2015 when they gave up 173 yards per game. Since the front seven is doing so well against the run, teams have little choice but to pass. In addition, when the Badgers’ opponents are trailing, they are going to pass more to get back in the game, which will also hurt the pass defense numbers. Derrick Tindal leads the team with 3 interceptions and is also tied for the lead in pass breakups. He is tied with Sojourn Shelton who has been very good at his cornerback spot this year. Leo Musso (23 tackles and an interception) has come up with some big plays this year as well at safety (see the fumble return for a touchdown against Michigan State). The back four has not been without injury as Natrell Jamerson was injured with Lubern Figaro filling in. Also, Tindal had a recent surgery and while he is not expected to miss time, any injury or surgery is a concern. The defense has been the strength of the team and they have helped the Badgers reach their 4-1 record. They will be the key the rest of the way as well and they deserve any accolades they get through five games. 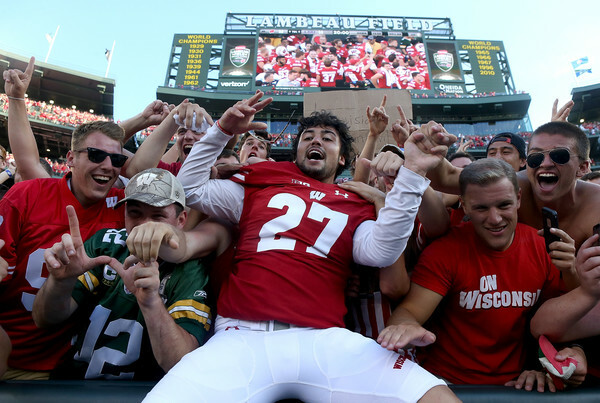 The Badgers lost kicker Rafael Gaglianone to a back injury and that hurts them. He is a reliable kicker (10 for 10 on extra points and 7 for 8 on field goals with a long of 48 yards). He will be replaced by Andrew Endicott, who was shaky against Michigan State with a missed extra point, but hit his other three kicks (1 field goal and three extra points). This will be worth watching for the final part of the season. The punting game is still unsettled as both Anthony Lotti (37.5 average) and P.J. Rosowski (38.8 average) have seen action at that position. They will need to improve for the Badgers. The return game has been held in check with no touchdowns and limited return yardage. Jazz Peavy has 7 punt returns for an average of 5.7 yards per return while the kickoff return is led by Dare Ogunbowale (22 yard average on 6 kick returns). This group will have to improve as well, but they have the playmakers to make this unit dangerous. Prior to the start of the season, Wisconsin faced a daunting schedule with LSU and then again at the beginning of the Big Ten slate. That did not change as the season went from week to week. LSU was a tough out, but the Badgers won. The same goes for Michigan State, but the Badgers won more convincingly. Then came the Michigan game when the Badgers lost by a touchdown to a Michigan team that had dominated them in every facet, but the score. To start 4-1 is considered a very good based on what what expected of their opponents at the start of the season. That still has not changed even if LSU fired their coach and Michigan State has not been their best. The tough part is still not over as the Badgers as they face Ohio State, Iowa, and Nebraska to close out October. The defense has been very good this year allowing 12.2 points per game and helping the offense gain some momentum. The offense has not been in peak form with something always seeming to need work from week to week. However, the overall team performance has been impressive. Below is the schedule for the Badgers for the rest of the year as well as the results of the first five games. The eighth ranked Wisconsin Badgers went on the road and lost 14-7 to the #4 ranked Michigan Wolverines. It was a very physical and defensive game with both teams struggling mightily on third down (7 of 30 combined). The Badgers had a lot of issues on offense and we will look at the good and bad from this game. 1. The defense played a superb game – The strength of this Wisconsin team is the defense and they played incredible for the entire contest. Nearly every time the defense needed to make a play, they stepped up and stopped Michigan’s offense. And all this happened without Vince Biegel, who will be out for a few weeks. The defense even got the offense going on the great defense play by Jack Cichy and the ensuing interception on Cichy’s tip by Derrick Tindal. 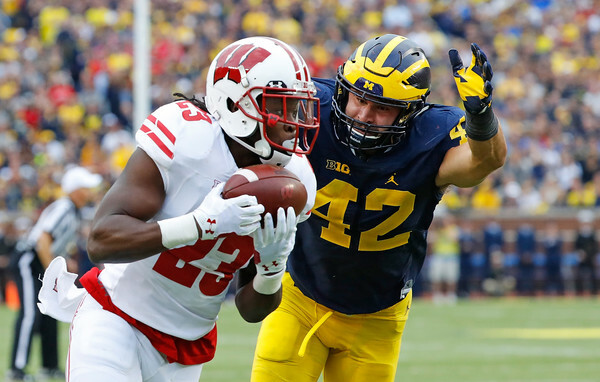 The Badgers yielded 349 yards to Michigan’s offense, but forced three field goal attempts from the Wolverines that ended up resulting in zero points. That is the same bend, but do not break defense we have seen in all of their big contests this year (LSU, Michigan State, and Michigan). Guys like Cichy (12 tackles against Michigan), T.J. Watt (11 tackles and 1 sack), and T.J. Edwards (11 tackles), are going to be important for the final seven games. The one complaint is that the defense missed possible turnovers. The most obvious one was Lubern Figaro having a sure pick six go right through his hands. A play like that can turn a game around especially when the offense is struggling, but that does not take much away from their play against Michigan. 3. 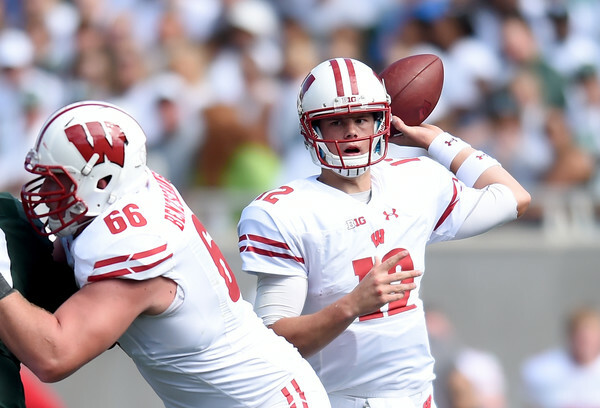 The offense was stagnant – While Hornibrook looked bad it is not fair to lay it all on him. The Michigan defense was excellent in this game, but the offensive line and running game really were not. The Badgers averaged just 71 yards on 28 carries as a team and the offensive line struggled to make any holes. This has been an issue all season with their average yards per carry in the first five games: 3.2, 5.3, 3.8, 3.0, and 2.5. For a team adamant on using their rushing attack, those numbers are subpar. The Badgers finished with just 159 yards on offense with Corey Clement as the top rusher with 68 yards on 17 carries. Robert Wheelright had 3 catches for 46 yards while Dare Ogunbowale had 3 catches for 23 yards and a nice touchdown grab a wheel route (one of the few good offensive plays for the Badgers). The receivers, admittedly not one of the best groups around, had trouble getting open against the likes of Jourdan Lewis. That made it difficult for Hornibrook to be comfortable with this throws, which is part of the reason why he only completed 9 of 25 passes for 88 yards. A lot needs to be improved on offense especially with Ohio State coming to town in two weeks. 4. Special Teams – The Badgers were dealt a massive blow to the special teams unit earlier in the week with the news that Rafael Gaglianone would miss the rest of the season due to back surgery. Andrew Endicott hit his lone extra point, though it was just inside the upright. The punting game was more of a concern as Anthony Lotti struggled, which led to P.J. Rosowski seeing time as the punter in addition to his kickoff duties. Jabrill Peppers was able to get his chance to return on two punts, which is two more than he should be having. The Badgers are 4-1 overall and 1-1 in Big Ten play after the loss to Michigan. They have a bye next week before a game at home against Ohio State (ranked #2 coming into week five). Below are the previous columns for the Wisconsin games in 2016. #11 Wisconsin traveled to East Lansing to face #8 Michigan State on Saturday and they ended up with a big victory. They crushed the Spartans 30-6 with the defense having a big day. It was Wisconsin’s first victory at Michigan State since 2002. Let’s take a look at some things we liked and some things that still need to be worked on. 1. The game plan was excellent – A lot of the credit for the game plan goes to coach Paul Chryst and his staff. They used short passes and good routes to make Alex Hornibrook comfortable. The players deserve credit as well because they executed the game plan pretty well against a very good Michigan State team. In the first half, the Badgers were 5 for 8 on third down in 1st half and 2 for 2 on fourth down thanks in large part to the conversions being manageable. 2. Alex Hornibrook is not short of confidence – Hornibrook is not afraid to throw the ball even if the window is small. He threaded the needle a few times with success and other times with no so much success (last drive of the first half to Robert Wheelwright as well as the first drive of the second half to Troy Fumagalli). As long as Hornibrook does not let the bad plays bother him, such as the fumble early in the game and interception on the last play of the first half, then he will do well with his confidence and the poise he showed as well. Hornibrook finished 16 of 26 for 195 yards with a touchdown and two turnovers (fumble and interception). Those stats are not terrible when you consider it was his first start in college and it was in East Lansing at Michigan State. For the most part, he made the smart throw and did not try to do too much (a few exceptions though). The ceiling is high for him. 3. The defense never broke – There were plenty of drives for Michigan State that looked promising yet all the Badgers allowed were two field goals. They held the Spartans to 4 of 13 on third down as well as not allowing the Spartans to score on their two red zone possessions. The run defense did allow a few big rushes, but for the game only allowed 2.8 yards per carry (75 yards on 27 rushes). They ended up getting four turnovers (three interceptions and a fumble recovery) including the 66 yard fumble return for a touchdown by Leo Musso (see below). T.J. Watt was a constant nuisance in the backfield as he had 3.5 tackles for loss, 2.5 sacks, and 6 total tackles. It was an impressive performance against a good Michigan State offense. Leo Musso returns the fumble for a @BadgerFootball TD. 4. Chryst is not afraid to roll the dice on 4th down – Not having kicker Rafael Gaglianone probably made the decision easier for Chryst to go for it fourth down when necessary against the Spartans. The Badgers went for it twice on fourth down on the Badgers second drive converting both attempts. Chryst probably felt even more reassured after the shanked extra point by Andrew Endicott on the Badgers second touchdown drive. For the season, the Badgers have gone for it on fourth down five times and converted three of those. All of the attempts have been from the opponent’s 31 yard line or closer with an average placement of the 18 yard line. Chryst has a lot of trust in both his offense and defense, which is why he feels he can take chances on fourth down. 5. It was a constant grind for the running game – The Badgers constantly struggled to run the ball effectively against Michigan State, but that is not a surprise given the Spartans strong run defense. Against Notre Dame they allowed only 57 yards on 25 carries (2.3 average) while they allowed 87 yards on 33 yards versus Furman (2.6 average) in the season opener. It was no surprise that the rushing attack might have some trouble. Except for a couple decent runs the Badgers were stymied throughout, but they stuck with the run game. They finished with 122 yards on 41 carries for an average of 3 yards per rush. There were not the usual massive holes for the backs to run through, but Dare Ogunbowale looked most explosive (finished with 55 yards on 9 carries). Corey Clement finished with 54 yards and 2 touchdowns on 23 carries after missing last week with injury. Perhaps all those small runs were subtly effective for Hornibrook and the rest of the offense, especially in the first half. The Wisconsin Badgers have opened 4-0 and they will be back in the state of Michigan with a game at the #4 ranked Wolverines next week. Game time is scheduled for 3:30 PM Eastern Time. Below are the previous columns for the Wisconsin games in 2016. The Wisconsin Badgers flirted with disaster against Georgia State, but ultimately squeaked by the Panthers with a 23-17 win. It was ugly and left a large amount of concerns heading into the start and daunting part of their Big 10 schedule. Let’s look at some thoughts below. 2. Alex Hornibrook looked much more comfortable leading the offense – After one drive in the second half with Houston at QB, Paul Chryst decided to put Alex Hornibrook in. The entire offense responded with a touchdown drive and Hornibrook looked better running the offense. In fact, the offense was far more efficient with Hornibrook in than with Houston. Hornibrook led the final five drives of the game and the offense finished with 192 yards along with two touchdowns and a field goal (the fifth drive ended the game). Houston led six drives and the offense had 223 yards and just two field goals to show for it. It was not all Houston’s fault, however. Corey Clement did not start while the duo Taiwan Deal and Troy Fumagalli got injured during the game. Neither player returned after their injury and there was also the fumble by Shaw on the goal line. Still, Hornibrook was able to make do with the lack of those players and looked better too. In addition, the offensive line was dominating the trenches as the Badgers had 25 carries for 120 yards in the first half (the Badgers finished with 49 carries for 187 yards on the game). Now we go to point three…. 3. Who leads the offense? – This is the classic case of the (very recent) hot hand versus the starter. Hornibrook looked better leading the offense against Georgia State, but maybe that was due to the lack of preparation by the Panthers for him. Houston was made the starter for a reason and he has shown some talent, but also some struggles along the way (read here and here for those). The presumptive return of Clement will also help either quarterback, but the upcoming schedule will still cause fits. Coach Chryst has an interesting decision on his hands. 4. The defense had trouble against the pass – Does anyone else have an in route or slant they would like to run against the defense? The Badgers were constantly burned by those routes in the final three quarters after dominating the first 15 minutes in which they allowed just five total yards of offense to Georgia State. Conner Manning was 9 of 12 for 79 yards in the second quarter (and the same total for the entire first half). While the Badgers were not punished in the first half for the poor pass defense, they sure were in the second half. The Panthers were able to record pass plays of 20 yards (twice), 38 yards, 40 yards, and 60 yards against Wisconsin. All of those with the exception of one of the 20 yard plays occurred in the second half. Manning finished the game 20 of 29 for 269 yards with one touchdown. Only four Panthers caught a pass: Glenn Smith (5 catches for 131 yards), Robert Davis (8 for 93 and a touchdown), Keith Rucker (6 for 38), and Kendrick Dorn (1 for 7). The Badgers must improve on this. 5. The young guys showed good and bad – Let’s get the bad out of the way early: Bradrick Shaw’s fumble at the goal line cannot happen. As such, Shaw was punished with fewer carries the rest of the way, but at least he did not make another big mistake with his second chance as well. There was also the pick by Hornibrook that went right through George Rushing’s hands. Shaw did some good early on. Once again, he looked powerful and showed strength, which will suit him well when he gets a bigger share of the carries down the road. Alex Hornibrook came and and led the Badgers to the win. Sure, Wisconsin led 6-3 when he came in, but he did well to lead the offense (read above). Freshman Kyle Penniston had a vital role as he caught a 29 yard pass and a 1 yard touchdown pass from Hornibrook on the go-ahead drive midway through the fourth quarter. 6. Mounting injuries a concern – We do not yet know the severity of the injuries to Clement, Fumagalli, and Deal, but they are a big concern. Clement is the starter at running back while Deal provides solid depth. Fumagalli is the starting tight end and showed reliablity in the passing game when needed. Losing any of these guys for an extended period of time will be a blow to the offense. The one silver lining is that younger guys are getting big time reps.
7. Special Teams played better – A big issue against Akron last week was the first half special teams play. They did better in the final 30 minutes last week and they looked back to normal against Georgia State. The only real bad moment was the usually solid Rafael Gaglianone missing a 30 yard field at the end of the first half. He redeemed himself late in the game with a 41 yard field goal to make it 23-17. The brutal stretch for Wisconsin begins next week with a trip to Michigan State. One of the big games during college football’s opening weekend was between the LSU Tigers and Wisconsin Badgers. The game was played at Lambeau Field in Green Bay, Wisconsin and it did not disappoint the near 80,000 fans in attendance. The Badgers won 16-14 over #5 ranked LSU thanks to a late field goal by Rafael Gaglianone with 3:47 left in the game. The Badgers did some things well against LSU and there was also some things they must improve on. Below are some thoughts on what those things are. 1. A repeat of 2014 was avoided – It was not difficult to see this game unfold in much the same way the 2014 contest did. Two years ago, Wisconsin held a double digit lead early in the third quarter before seeing it evaporate. Then, it was a 24-7 lead after the Badgers scored on their first drive of the second half. In 2014, the Tigers won 28-24 after scoring the last 21 points and holding the Badgers to 65 yards in the fourth quarter. This time around, Wisconsin led 13-0 after their first drive of the second half (again scoring a touchdown to start their final half) only to give up 14 points in the span of 67 seconds. The Badgers got it together and drove down the field late in the game to give them the chance to win, which Gaglianone did with a 47 yard field goal. 2. The offense needs to be more efficient – The Badgers dominated the first half on both offense and defense, but only came away with a 6-0 lead halfway through the game. Head coach Paul Chryst opted to go for it on fourth and one early in the game on the second drive, but the offense could not get the needed yard. Quarterback Bart Houston threw a pick straight to LSU’s Rickey Jefferson in the end zone to keep the game scoreless. The second half saw Houston throw his second interception of the game and this one put points on the board for LSU as it was returned for a touchdown by Tre’Davious White. That interception was followed up by a fumble on the next drive for Wisconsin. Receiver George Rushing caught the ball, but did not secure it as he was hit. Once again, White was there for the recovery and all the momentum (along with the lead) shifted to LSU after their ensuing touchdown drive. For the game, the offense was 3 of 15 on third downs, another area that must improve. The Badgers were officially 2 of 3 inside the red zone, but it felt worse than that with the missed fourth down just outside the red zone and the fact they settled for field goals. Fournette did get going in the second half. He broke a 30 yard run on LSU’s second drive of the third quarter, a drive in which he ended up with 51 yards on 4 carries. He also had a big catch for 31 yards right after the George Rushing fumble that set up LSU’s second touchdown. It is very difficult to stop Fournette, but the Badgers did contain for much of the game. 4. Bart Houston has some work to do – This game presented a double-edged sword in regards to Houston. He played decently with two interceptions, both of which were terrible throws and should have never been thrown. However, he faced one of the game’s best defensive coordinators in Dave Aranda and survived. It is not easy to face your team’s former defensive coordinator all the while starting your first game since late 2011 when your were in high school. In addition, this game was in Lambeau Field combined with the fact he is named after former Green Bay Packers quarterback Bart Starr. Maybe it was a summation of all those things that led to some of his nervous moments. There were some good moments too. Often he would take what the defense gave him and he found his personal safety valve in Troy Fumagalli (7 catches for 100 yards). It will be interesting to see how those two develop together over the season. Could they be reminiscent of the connect Joel Stave and Alex Erickson seemed to have the previous two seasons? 5. How does this game shape the rest of 2016? If the Badgers can take their first half defense against LSU and combine it with their opening third quarter drive, this team will be difficult in every game. But games are not played in a vacuum, mistakes happen, and there is daunting part of 2016 schedule for the Badgers. The Badgers will open 3-0 as they face both Akron and Georgia State the next two weeks at home. Few schedules will rival what Wisconsin faces over a five week span: at Michigan State (9/24), at Michigan (10/1), home to Ohio State (10/15), and at Iowa (10/22). Oh and all of those teams are ranked in the top 20 as of this writing. Brutal. Week seven of the college football season saw six Big Ten Conference games. Sitting idle were the Maryland Terrapins and Illinois Fighting Illini. Iowa put forth a dominant win over Northwestern on the road to put a virtual hammerlock on the Big Ten West Division midway through October. There was a loss in the form of running back Jordan Canzeri, but they did just fine with his replacements. Iowa raced out to a 16-0 lead before a 10-0 run by the Wildcats made it 16-10 at the half. It was all Iowa after that with the final 24 points. C.J. Beathard had a pedestrian game with 15 of 25 passing for 176 yards with no touchdowns and an interception, but this was all about Iowa’s rushing attack. Canzeri went down early with an injury and was seen in a walking boot a short time later. Akrum Wadley stepped right in and made it seem like Canzeri never left. Wadley ran for 204 yards and 4 touchdowns on 26 carries. Derrick Mitchell Jr. had 79 yards and a touchdown on 10 carries as well. Iowa finished with 492 yards of offense and went 9 of 18 on third down. Matt VandeBerg had 8 catches for 78 yards. Northwestern’s offense struggled once again. Clayton Thorson went 17 of 35 for 125 yards with one touchdown and one interception. He also had 11 carries for just 10 yards. Even Justin Jackson was stymied with only 30 yards rushing on 10 carries. The Wildcats saw 10 different receivers catch a pass and six of them had at least two catches. Northwestern had only 198 yards of total offense and went 8 of 19 on third down. For Iowa, Desmond King recorded his sixth interception this season and continues to be a one-man turnover machine. Iowa (7-0, 3-0) will welcome the bye next weekend before a home game against Maryland on Halloween. Northwestern (5-2, 1-2) have lost back-to-back games and face a road test at Nebraska next week. Wisconsin waited until late in the third quarter to put some breathing space between them and Purdue in a lackluster performance by the offense. Joel Stave went 30 of 39 for 322 yards with no touchdowns and an interception. His interception was an overthrown ball with a big return that eventually led to a touchdown for Purdue. The running game was handled by Dare Ogunbowale with Taiwan Deal out with an injury. Corey Clement was dressed for the game but did not play. Alec Ingold had 9 rushes for 19 yards, but had the first and last touchdowns of the game. The passing game for Wisconsin was made up of mostly the short variety of passes. Alex Erickson had 9 catches for 86 yards while Robert Wheelwright had 6 catches for 61 yards. Dare Ogunbowlae also had 6 catches, but for 51 yards. The Badgers racked up 418 yards of offense and went 7 of 14 on third down. Rafael Gaglianone missed a field goal late in the first half, which marks sixth game this year that he has missed a field goal. He is 10 for 17 on the season. David Blough could not get any rhythm as he finished 15 of 26 for 136 yards. Markell Jones ran for 46 yards on 12 carries and D.J. Knox had 10 carries for 24 yards. Purdue had 191 yards of offense and went a paltry 4 of 13 on third down. The Boilermakers held the ball for only 22 minutes and 14 seconds during the game. Purdue (1-6, 0-3) has a bye next week and will play at home against Nebraska on October 31. Wisconsin (5-2, 2-1) faces Illinois on the road next week. The Illini are coming off a bye. This game was about offense and only a touch of defense. It was also about Indiana blowing a 52-27 lead in final 18 minutes of the game. As one can imagine with a 55-52 score line, the quarterbacks had pretty good games. Chris Laviano went 28 of 42 for 386 yards with 3 touchdowns and a pick. His top target was none other than Leonte Carroo who had another massive game. Carroo had 7 catches for 157 yards and 3 touchdowns, but left in the third quarter after an injury and did not return. Robert Martin ran for 124 yards and 3 touchdowns on 17 carries while Paul James added 42 yards and a touchdown on 6 carries. Rutgers rushed for 210 yards as a team. Rutgers did pretty well on third down going 12 of 20 and amassed 596 yards of offense. Indiana was glad to see Nate Sudfeld back and he had a big game going 32 of 42 for 464 yards with 4 touchdowns and 2 interceptions. Jordan Howard was still out, but Devine Redding was able to rush for 99 yards and 2 touchdowns including a 66 yard touchdown run in the third quarter to make it 52-27. Three different Hoosiers finished with at least 100 yards receiving. Mitchell Paige had 8 catches for 126 yards, Ricky Jones had 6 grabs for 119 yards and a touchdown, and Simmie Cobbs Jr. had 7 catches for 107 yards. Jordan Fuchs had just two catches for 9 yards, but both went for touchdowns. Indiana had 627 yards of offense, but struggled on both third and fourth down. The Hoosiers went a combined 3 of 14 on those two downs. After Redding’s touchdown run made it 52-27, a series of miscues allowed Rutgers to tie the game. A 26 yard fumble return by Kemoko Turay made it 52-39 while the two interceptions by Sudfeld were turned into touchdowns as well. Rutgers (3-3, 1-2) faces Ohio State next week at home. Indiana (4-3, 0-3) saw one of their better opportunities for a win fade away in the final quarter and have to play Michigan State next week in East Lansing. Of the craziest finishes to a college football game in history, this ranks up there near the top. The Spartans pulled off a shocking final play to win 27-23. Connor Cook was not very accurate going 18 of 39, but threw for 328 yards with a touchdown. The rushing game for both teams was stuffed all game long. The Spartans finished with 58 yards on 33 carries with Gerald Holmes leading the team with 8 carries for 33 yards. LJ Scott had two touchdown rushes on 8 carries for 16 yards. Aaron Burbridge had a big game with 9 catches for 132 yards. Macgarrett Kings had 3 catches for 57 yards and a touchdown, but also had a few big drops. The Spartans had 386 yards of total offense, went 3 of 12 on third down, and 0 for 4 on fourth down. Michigan was led by a decent performance from Jake Rudock. He went 15 of 25 for 168 yards with no touchdowns, but did not commit a turnover. The rushing game did only slightly better than Michigan State with 33 rushes for 62 yards. De’Veon Smith led the team with 46 yards on 19 carries while Sione Houma had 3 rushes for 30 yards and 2 touchdowns. Jehu Chesson had 4 catches for 58 yards and Amara Darboh had 3 catches for 52 yards. Michigan had only 230 yards of offense and converted 4 of 15 on third down. There was just one turnover in the game and it came on the last play. 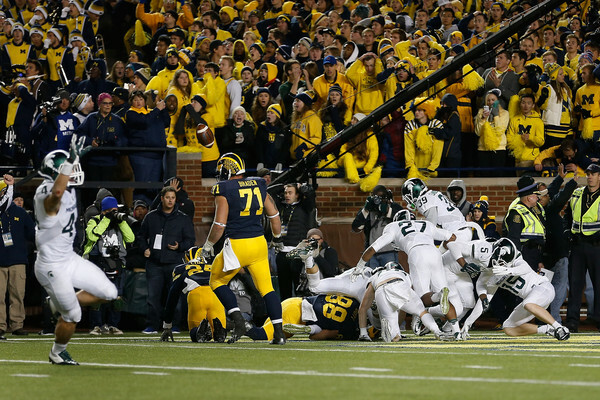 A bobbled punt by Blake O’Neill was returned by Michigan State’s Jalen Watts-Jackson for the win in a truly incredible finish. Michigan State (7-0, 3-0) faces Indiana next week at home. Michigan (5-2, 2-1) has a bye week and faces Minnesota on the road October 31. Nebraska played a good game on offense and did not have to worry about another heartbreaking loss this week. In fact, it was the defense that made sure there would not be another late loss. Tommy Armstrong went 18 of 26 for 261 yards with 3 touchdowns while also rushing for 38 yards. Terrell Newby had a nice game on the ground with 116 yards and 2 touchdowns on 13 carries. Alonzo Moore had 4 catches for 84 yards and a score while Jordan Westerkamp made 6 grabs for 76 yards. Nebraska had 464 yards of offense and went 7 of 13 on third down. With under three minutes to play, Minnesota was mounting one last challenge down 16 points before a 41 yard pick six by Joshua Kalu. Just to be safe, Nate Gerry intercepted Minnesota on the next drive to truly end the game. Minnesota got a rare big game passing from Mitch Leidner. He went 26 of 40 for 301 yards with a touchdown and the two aforementioned picks. The rushing game was held in check with only 65 yards on 26 carries. Shannon Brooks had 25 yards, KJ Maye had 21 yards and a touchdown, and Rodney Smith had 20 yards. Maye also had 11 catches for 94 yards while Eric Carter caught 4 passes for 91 yards and a touchdown. Minnesota had 366 of offense and went 6 of 15 on third down. Nebraska (3-4, 1-2) faces Northwestern next week at home. Minnesota (4-3, 1-2) will play Michigan on October 31 after a bye next week. It was a slow start for the Ohio State offense, but a 21 point stretch on three straight touchdown drives gave them more than enough points. Cardale Jones had poor numbers going 9 of 15 for only 84 yards and was substituted in or near the red zone by J.T. Barrett. Barrett went 4 for 4 with 30 yards and 2 touchdowns through the air, but was most effective with his legs. He ran for 102 yards and 2 touchdowns on 11 carries and really helped spark the offense. Ezekiel Elliott had his usual good game with 153 yards and a touchdown on 27 carries. Braxton Miller had some rushes finishing with 4 carries for 30 yards. Miller lead the team with 4 catches and was second with 33 yards along with a touchdown catch. Michael Thomas had 3 catches for 34 yards and a touchdown as well. The offense had 429 yards while going 5 of 11 on third down. Penn State had a rough time passing the ball with Christian Hackenberg going 7 of 13 for 120 yards and a touchdown. Penn State had success on the ground thanks to Saquon Barkley’s 194 yards on 26 carries. Chris Godwin had 3 catches for 103 yards and a big 56 yarder. Penn State had 315 yards of offense, but struggled mightily on third down with only 1 conversion on 12 attempts. Penn State (5-2, 2-1) will face Maryland next week at home looking to secure bowl eligibility. Ohio State (7-0, 3-0) will travel to play Rutgers next weekend. Check back next Sunday for the Week 8 edition of the Big Ten Roundup. The sixth week of the college football team saw all 14 Big Ten teams playing in conference clashes. Some teams performed well while others did not. Let’s take a look at each game. Ohio State may be the top ranked team, but they have not played like the team was saw last year. Cardale Jones started the game, but J.T. Barrett saw plenty of action as well. The offense had a pretty good performance overall with almost 500 yards, but the defense gave up 21 points to a previously hapless Maryland offense. Jones went 21 of 28 for 291 yards and 2 touchdowns while Barrett had 3 rushing touchdowns along with 62 yards rushing on 12 carries. Ezekiel Elliott was held in check compared to last week, but still finished with 106 yards and 2 touchdowns on the ground. Michael Thomas had 7 catches for 107 yards while Braxton Miller was electric again with 5 catches for 79 yards and a touchdown. For Maryland, they opted to go with Perry Hills and it appears to have paid early dividends even if they still lost by 3 touchdowns. They key here is the offense found something that was not there previously. Hills was a terrible 10 of 27 for 133 yards with a touchdown and 2 interceptions, but was a menace running the ball. He had 25 carries for 170 yards and 2 touchdowns to give the Buckeyes fits. Ohio State gave up 386 total yards and allowed 6 of 16 on third and fourth down conversions. They struggled early against a team that also had their coach relieved earlier this week. It is a troubling pattern for a team that is ranked number one. Maryland (2-4, 0-2) has a bye next week before facing Penn State at home on October 24. Ohio State (6-0, 2-0) will get Penn State next week at home. Iowa’s offense looked better at home one week after struggling on the road at Wisconsin. This week was against Illinois. C.J. Beathard went a paltry 15 of 31 through the air, but had 200 yards and 2 touchdowns in a secondary performance to the running back. Jordan Canzeri ran wild for Iowa on offense with 256 yards and a touchdown on 43 carries. Jerminic Smith had a big game with 4 catches for 118 yards including a few nice grabs. The offense had 478 yards of total offense with no turnovers. One of the only knocks on the offense was they ended up settling for 3 field goals with all three converted by Marshall Koehn. Koehn did miss an extra point early in the game that nearly had consequences late in the fourth quarter, but was good outside of that miss. Another knock was that they converted just 4 of 16 third downs. Illinois seemed to have trouble finding consistency in the first half with only 7 points that came on their second drive. Part of the issue may have been due to the absence of Josh Ferguson, who missed the game due to a shoulder injury. Illinois’ touchdown drive went for 67 yards while their other six drives totaled 49 yards combined. The second half was better for Illinois with some up-tempo offense. Wes Lunt looked better throwing the ball and he combined with Geronimo Allison for several big plays. Lunt finished 25 of 42 for 317 yards and a touchdown while Allison caught 8 passes for 148 yards and a score. Ke’Shawn Vaughn had 67 yards and a touchdown on 19 carries. Illinois will need to be better on defense as noted by the 256 rushing yards allowed to Canzeri. They will also need to force more turnovers to give their offense a chance to build a lead. Illinois (4-2, 1-1) has a bye next week and will face Wisconsin at home on October 24. Iowa (6-0, 2-0) play Northwestern on the road next week with a chance to put a hammerlock on the Big Ten West division with a win. Indiana struggled on offense this week while Penn State was decent on offense and very good on defense to lead them to yet another win. Zander Diamont got the start with Nate Sudfeld out. He suffered an injury of his own in the third quarter and was replaced by Danny Cameron. Diamont led Indiana to a touchdown early, but the offense did not do much after that. Diamont finished the game going 9 of 17 for 90 yards passing as well as 11 rushes for 38 yards and a touchdown. Cameron was 6 of 16 with 65 yards and an interception. Devine Redding had 13 carries for 32 yards with Jordan Howard not playing. It was not pretty for Indiana outside their touchdown drive. For the game, Indiana went 3 of 16 on third down and finished with 234 yards of total offense. Penn State did not have any issues on offense as Christian Hackenberg went 21 of 39 for 262 yards and 2 touchdowns. On top of that, he also had 9 rushes for 21 yards and 2 touchdowns thanks to two short runs near the Indiana goal line. The Nittany Lions continued to be without their top two rushers. Nick Scott got 8 carries for 57 yards while Mark Allen also had 8 carries and 45 yards. Penn State had 420 yards of total offense and held a nearly 36-24 minute lead in time of possession. Penn State’s defense was led by Carl Nassib, who had two forced fumbles and two sacks. The entire defense had a very good game and continue to look good. Indiana (4-2, 0-2) will face Rutgers at home hoping to see Nate Sudfeld and Jordan Howard play. Penn State (5-1, 2-0) have a big test on the road at the Horseshoe against Ohio State. Michigan continued their incredible defensive streak by posting a third straight shut out. All phases of the game got in on the act as well. 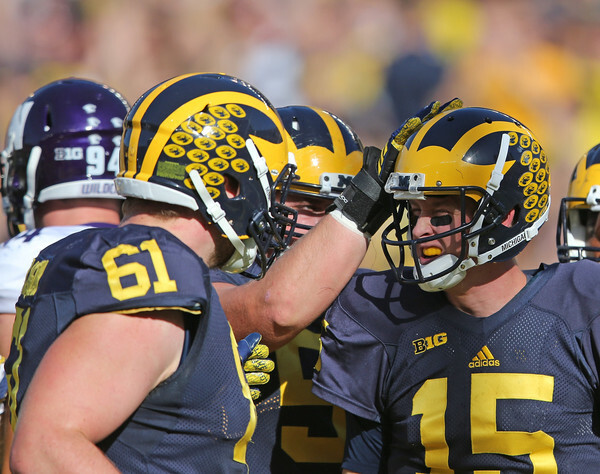 Jake Rudock had a quiet, but efficient game going 17 of 23 for 179 yards. De’Veon Smith had 8 carries for 59 yards while Derrick Green had 47 yards and a touchdown on 12 rushes. The offense finished with 380 yards of offense and went 7 of 14 on third downs. Northwestern had only allowed 35 points in the first five games prior to this contest. The Michigan defense was superb. Justin Jackson had only 25 yards on 12 carries. Clayton Thorson went 13 of 27 for 106 yards with an interception. Northwestern totaled 168 yards of offense and went a putrid 2 of 13 on third downs. A lot of that is due to the Michigan defense, which got a pick six from Jourdan Lewis, who ripped the ball out of the receiver’s arms and sprinted down the sideline for a 37 yard return. Michigan’s special teams started the day with a 96 yard kickoff return by Jehu Chesson and it was all Wolverines after that. Northwestern (5-1, 1-1) faces Iowa next week at home in a massive Big Ten West game. Michigan will take on Michigan State at home next week in a huge game of their own. Stop if you have heard this one before: Nebraska lost a heartbreaker. It was their fourth loss of the season, all in close fashion. Wisconsin had a tough time getting their running game involved early on. It was not until the fourth quarter when the Badgers were able to run the ball. Dare Ogunbowale finished with 18 carries for 117 yards while Taiwan Deal managed just 4 carries for 8 yards and left early due to an ankle injury. Alec Ingold was the third string running back and finished with 14 yards and a touchdown on 8 carries. Joel Stave went to the air quite a bit due to the poor rushing attack. He went 24 of 50 for 322 yards with a touchdown. He found two of his favorite targets in Alex Erickson (7 catches for 113 yards) and Robert Wheelwright (5 catches for 81 yards). With Austin Traylor out at tight end, Troy Fumagalli stepped up to finish with 6 catches for 60 yards and a touchdown. The offense struggled on third down again going just 5 of 16, but racked up 469 yards of offense. Nebraska ha issues moving the ball at times against Wisconsin. Tommy Armstrong went 11 of 28 for 129 yards and a touchdown through the air, but was dangerous running the ball with 50 yards and a touchdown on 8 carries. Andy Janovich and Terrell Newby both had 59 yards rushing while Janovich had a nice 55 yard touchdown run in the fourth quarter to give the Huskers a slim lead. Nebraska had 325 yards of offense and went 8 of 18 on third downs. The defenses were both solid for much of the game. In the fourth quarter, the offenses came to life to provide an excellent game. Wisconsin was lucky to get the win thanks to Rafael Gaglianone, but he went 3 of 5. Nebraska kicker Drew Brown missed his only field goal attempt in another play that could be looked back on as a what if moment. Wisconsin (4-2, 1-1) faces Purdue at home next weekend. Nebraska (2-4, 0-2) has another tough game with Minnesota next week on the road. A potentially dangerous game for Minnesota turned into a rout with a big 28 point third quarter for the Gophers. Minnesota’s passing game was hardly featured, but it was not needed often. Mitch Leidner went 8 for 12 for 59 yards with 2 touchdowns and an interception. Brandon Lingen caught both of those touchdowns and had 3 catches for 22 yards total. Shannon Brooks had a great game rushing with 176 yards and a touchdown on 17 carries while Rodney Smith had 52 yards on 13 carries. The Gophers ran for 326 yards and 2 touchdowns on 48 carries as a team. Purdue struggled on offense. David Blough went 21 of 49 for 207 with a touchdown, but also threw 3 interceptions. D.J. Knox had 13 carries for 60 yards and a touchdown with Purdue managing just 275 yards of total offense. One of the interceptions was returned for a touchdown by Minnesota’s Jalen Myrick. Purdue went 3 of 17 on third down and the turnovers hurt them immensely. Minnesota (4-2, 1-1) faces Nebraska next week at home. Purdue (1-5, 0-2) has the tough task of going into Madison and playing Wisconsin next weekend. Michigan State was able to escape their road game at Rutgers thanks to a blunder by the Scarlet Knights on a night that featured both quarterbacks. Connor Cook had a good game going 23 of 38 for 357 yards with 2 touchdowns and an interception. His top target once again was Aaron Burbridge, who had 9 catches for 146 yards. The Spartans struggled to run the ball at times with LJ Scott led the team with 9 carries for 42 yards and 2 scores. Michigan State seemed as if they had no trouble converting on third down and they finished 11 of 17 on that important down. Rutgers was led by Chris Laviano going 15 of 24 for 208 yards and 3 touchdowns, but most importantly did not throw an interception. Leonte Carroo had his second three touchdown receiving game of the year with 7 catches for 134 yards and 3 scores. Paul James had only 2 carries, but that was good enough for 74 yards thanks to his long 72 yard run. Robert Martin had 61 yards on 13 carries as well. Rutgers was the opposite going 3 of 12 on third down and 2 of 3 on fourth down. Neither defense played terribly, but neither was outstanding. Laviano spiked the ball with seconds remaining on fourth down after a sack, which caused Rutgers to lose. It was fourth and 20 at midfield so the chances were not great, but it became zero with the spike. Michigan State (6-0, 2-0) will face in-state arch-rival Michigan on the road next week. Rutgers (2-3, 0-2) plays Indiana on the road next weekend. Check back next Sunday for the Week 7 edition of the Big Ten Round Up.